What is “Cushings Disease”? What does ACTH testing mean? 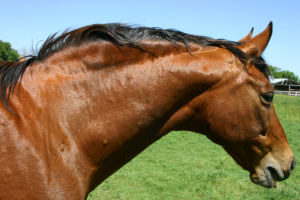 “Cushing’s Disease”, also known as Equine Pituitary Pars Intermedia Dysfunction (PPID), is a condition most commonly affecting older horses (typically 15 years or older). In this condition, a gland that sits at the base of the brain called the Pituitary gland becomes enlarged and produces too much of the hormone called the adrenocorticotropic hormone (ACTH), as well as a few other hormones. High levels of ACTH cause an over production of cortisol from the adrenal glands. The clinical signs of Cushing’s include delayed shedding or incomplete shedding, long curly hair (often noted along the jaw or back of the fetlocks), inappropriate or abnormal sweating, increased water intake and urination, decreased energy, and lack of muscle or muscle loss. Horses that have Cushing’s have a lowered immune response and therefore are more prone to infections and have a more difficult time clearing infections. There is a link between horses with Cushing’s and insulin resistance, which pre-disposes horses to laminitis; therefore it is important to test for and treat Cushing’s/insulin resistance in horses that are showing clinical symptoms. How do we test for Cushing’s? Typically, a blood sample will be pulled and submitted for plasma ACTH levels. Horses with Cushing’s disease have high levels of plasma ACTH. Most horses showing symptoms of Cushing’s can be diagnosed with this test, however, plasma ACTH levels can fluctuate with the season. From Mid-July to Mid-December, normal horses will experience a spike in plasma ACTH levels. Horses with Cushing’s disease will also experience this seasonal spike; however, they seem to experience an exaggerated spike in their plasma ACTH levels. Therefore, horses that are early on in the progression of the disease can be detected easier if we test during this seasonal spike. For instance, if a horse is in the early stages of Cushing’s, they can test within, or barely above, the normal ranges of plasma ACTH levels when measured during other times of the year, but when tested in the time of their ‘seasonal spike’, they will have plasma ACTH levels significantly higher than the adjusted normal range. If a horse is showing symptoms of Cushing’s Disease and has a normal ACTH level, then we recommend either re-testing ACTH levels during Mid-August to Mid-February, or a TRH stimulation test. The TRH stimulation test involves a baseline blood sample, followed by administration of TRH IV, and other blood sample taken 10 minutes later. It is recommended to perform the TRH stimulation test outside of the time of the seasonal spike. Pergolide (Prascend) is the recommended treatment of Cushing’s disease. This comes as a small tablet that can go in their feed once a day. Treatment, once started, will need to be maintained for the rest of the horse’s life as it only treats the symptoms of Cushing’s disease and does not fully reverse the disease. After initially starting this medication, a sample will need to be taken about 4-6 weeks later to ensure that their ACTH levels are normalizing and the dosage may be adjusted. Once a horse is on Prascend and their ACTH levels are maintained in the normal range, they will need to be monitored twice a year for their ACTH levels. Occasionally, when first starting Prascend, inappetence (or unwillingness to eat) occurs and usually will resolve. Starting the horse on a smaller dose and gradually increasing to the required dosage can help diminish this issue as well.